Meet the Jasmine. The Jasmine is about 4 or so years old. A few years ago I decided I wanted a Moon Garden. A garden whose flowers bloom at night. 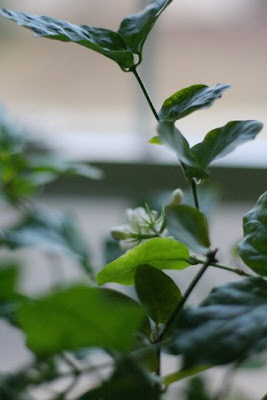 Jasmine has little white flowers that when they bloom in the evening create the most amazing fragrance. Often the entire plant will be covered in blooms and you can smell the scent from several feet away. Jasmine can get pretty big too. Someday I want a hedge of Jasmine.